Posted August 4, 2014, in News. 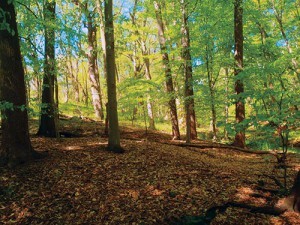 This fall, instructor Kimberlee Moran of the Department of Sociology, Anthropology, and Criminal Justice will offer a special topics anthropology course called “Doing Archaeology in South Jersey,” which will introduce students to the theory and practice of archaeological excavation through field experience at a site called “Whispering Woods” in Pilesgrove, New Jersey, located in Salem county. The Whispering Woods site is located in Pilesgrove, New Jersey, approximately forty minutes from Rutgers-Camden. Moran, a former grant facilitator at Rutgers University-Camden and the current director of the Center for Forensic Science Research and Education developed this course after a conversation with the owner of the Whispering Woods site. He has been trying to develop the property for housing, but found that the site required a Phase I archaeological survey because it was near a tributary and known archaeological sites. A local Cultural Resource Management (CRM) firm performed the work and uncovered enough prehistoric (Native American) and historic artifacts that the State of New Jersey now requires a Phase II survey to better understand the site and to see if it’s eligible for the National Register of Historic Places. When the property owner found out that a second dig was needed, he contacted Moran to see if college students would be interested in getting involved. In addition to conducting the Phase II survey, students will learn archaeological theory and material culture, bioarchaeology, and artifact handling, preservation, and interpretation. The course is listed under 50:070:386:01 ST: Doing Archaeology in South Jersey, and is cross-listed with 50:512:475:01 Public History Internship. Space is limited, so interested students are encouraged to enroll immediately. The course likely will also be available in the spring semester. To follow the course’s progress, follow them on Twitter @RUdigging and Instagram (rudigging). Page last updated by Faculty of Arts and Sciences at 2:02 pm August 16, 2018 . This page was printed from http://fas.camden.rutgers.edu/2014/08/04/doing-archaeology-in-south-jersey-course-to-be-offered-fall-2014/ at 1:33 AM Monday, April 22, 2019.